A lightweight middleware for environments where performance is a priority. MWcore has been built from the ground up for demanding broadcast and enterprise environments where reliability and channel change speed are critical. Devices constantly synchronise with the central Middleware server but the user experience is not interrupted even if the central server is unavailable. This next generation of Middleware gives you even simpler ways to complete tasks, removing all complexity. We have designed the interface to be as dynamic and user centric as possible. With features such as real time updates, analytics and powerful management tools you can manage fleets of devices in any way you want from anywhere you want. Created around modern design practices, Middleware is suitable to be used on many types of devices ranging from desktops to tablets and mobiles. The user has all possible functionality even when using a tablet or mobile device remotely to ensure you can keep on top of your system. Real time information is vitial in enterprise and broadcast environments. 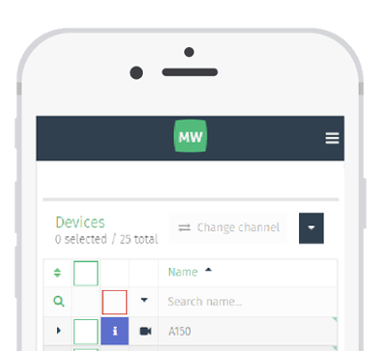 Middleware provides information on every aspect of every box, such as its online state, what channel is being viewed, volume, mute state and much more. When changing channel on a device that you're unable to see, feedback you can rely on is a must. This is what Middleware provides. Now with a native understanding of networking, Middleware has the ability to differentiate between devices on different networks. This allows you to define a single channel with multiple sources. Defining a locally distributed multicast to one of our many supported OTT solutions, Middleware will ensure that any device gets the most suitable source. Couple this with the reassurance that your content is secure with our intergrated DRM. Security is key in Middleware. It keeps both your passwords secure (using industry standard encryption) and has a flexible permissions engine to allow administrators to define what actions a user can perform either on a user-by-user basis or by groups of users. Middleware also has optional deep integration with LDAP servers, that incorporates both users (with extensive filtering) and security groups for permissions. Designed with intuition and usabilty in mind the simple yet effective interface is unobtrusive to the video to ensure that users can focus on the content that matters. The interface includes 14 day electronic programme guides (with the ability to view programme details), an extensive channel list and the ability to adjust everything you can in a traditional viewing experience. The interface boasts a clean and easy to read programme guide with both now and next when changing channel and the option to browse a larger view of 14 days of programmes. Programmes can be dynamically inserted via an API, or the addtional option of our vast collection of curated channels and programmes from the UK, Europe and North America (please contact us for more information on this service). 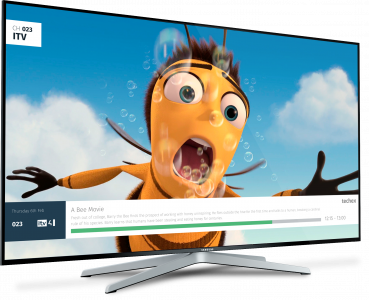 Pause live TV puts the user in control of what they want to watch and enables many different use cases. This feature is made to be as user friendly as possible, there is no management of assets needed like standard PVR implementations and is as simple as pressing pause. The always recording feature allows you to skip back to any content you may have missed. A user can select to play from any of the available audio languages available on a channel, as well as any of the available subtitle languages. This complements our multi-lingual administration interface. Middleware includes a full REST API which exposes all the functionality available through the administration interface for integration into external monitoring or control systems. You can programatically create new channels, swap devices to be watching these new channels, turn the volume up on the devices and add and edit new user accounts.